Bulking of sand refers to the volume expansion of fine aggregates (sand) for consuming of moisture. Whenever dry sand interacts with moisture a thin film is conformed around the sand particles that forces them to get aside from each other. These outcomes in expanding the volume of sand. Bulking of sand mostly relies on the amount of moisture and it increments with the expansion of dampness. It has been found that 4% of moisture content ( by weight) of dry sand may expand its volume up to 25% to 30 %, relying on the grading of aggregates. A fine sand particle absorbs more water and shows an extreme bulkiness. Facilitate expansion of water breaks the film around the particle and reduces the volume of sand. At the point when the amount of water in sand turns out to be more than 20% or the sand is completely submerged in water its volume turns into the same as that of dry sand. 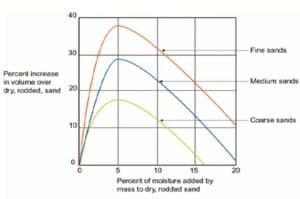 The percentage of bulking of sand can be easily calculated by following this field method. 1. Pour the sample of damp sand in a graduated glass cylinder of 250 ml capacity. 2. Consolidate the sand by shaking. When the sample is reached to 200 ml mark, fill the cylinder with water and stir well. 3. After stirring, the level of sand will be dropped below the 200 ml mark. Measure the height of submerged sand and mark it as “X” ml. Thus, the actual volume of corresponding dry sand can be figured out by subtracting from the measured volume of sand, the increase in the volume of bulkiness. How to reduce bleeding in concrete?